SAMSUNG Notebook 3 (14" & 15") and Notebook 5 (15") launched. Samsung Electronics today announced the Notebook 3 and Notebook 5, completing the Notebook portfolio. The Samsung Notebook 3 is available in 15 inches and 14 inches, while the Samsung Notebook 5 is available in 15 inches. Both Notebooks feature a slim, sleek, zero-screw contemporary finish continuing Samsung's design heritage. The Samsung Notebook 5 and Notebook 3 measure just 19.6mm and 19.9mm wide respectively, making them easy to use, carry, and transport. 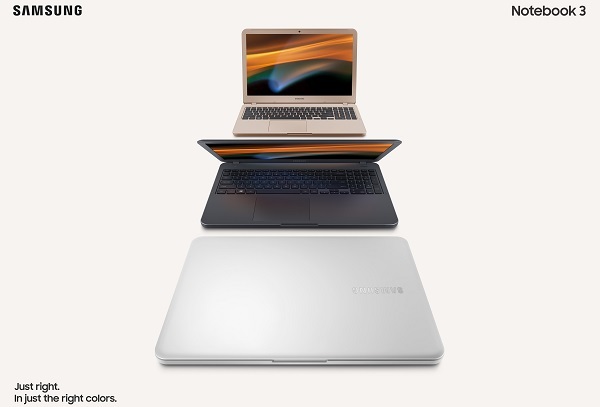 Designed to blend into any environment, the Samsung Notebook 3 is available in 15 inches and 14 inches, as well as, four unique colors - Misty Gray, Night Charcoal, Deep Peach, and Pure White, while the Samsung Notebook 5 is available in 15 inches and comes in a timeless and sophisticated Light Titan color, wrapped in a stylish metal body. The Samsung Notebook 5 and Samsung Notebook 3 are powered by an Intel Core i7 (Quad Core) Processor, a dual storage system (SSD + HDD) and NVIDIA GeForce graphics cards. These Notebooks have a wide precision touchpad, full-sized keyboards with number pads, and ergonomically crafted keycaps for comfortable typing. With an anti-glare panel, and colors tuned by Samsung Color Engine for stunningly vibrant images and videos, both devices are built with usability in mind. The devices will be available in select countries starting in April in Korea, with wider global releases including China and Brazil in Q2. Price will be announced at the time of launch.